Before the 1980s, the word “homelessness” did not appear in newspapers. It emerged in the popular lexicon to describe the visible results of Reagan’s decision to withdraw billions of federal dollars from affordable housing allocations — a decision that, along with other factors, quadrupled the number of people sleeping on the streets in most American cities. With this word we’ve put into existence a thing, which is actually not a thing. It’s a lack of a thing. This lack is depicted as a person with a cardboard sign or a shopping cart, on a park bench or under a bridge. (Try doing a Google image search of “homelessness” and you’ll see what I’m talking about). The story we’re telling about this picture is that individuals have circumstances that lead them to become homeless. We think it’s always been this way and maybe always will be. We imagine we have a choice to give or not give but other than that there isn’t much we can do. Meeting the immediate needs of people in crisis will save lives. But if we want to unravel this crisis then we have to unravel the story. Theater can help us do that. My belief in this statement stems from ten years working with the zAmya Theater Project of St. Stephen’s Human Services bringing together people who’ve experienced homelessness to tell stories and through my work as a founding artist and performing director at the radical community-based Bedlam Theatre. zAmya, like many other similar companies, have been inspired by the work of the Los Angeles Poverty Department (LAPD), which this weekend performs Hospital, a collaboration with Rotterdam’s Wunderbaum, as part of the Walker’s Out There series. 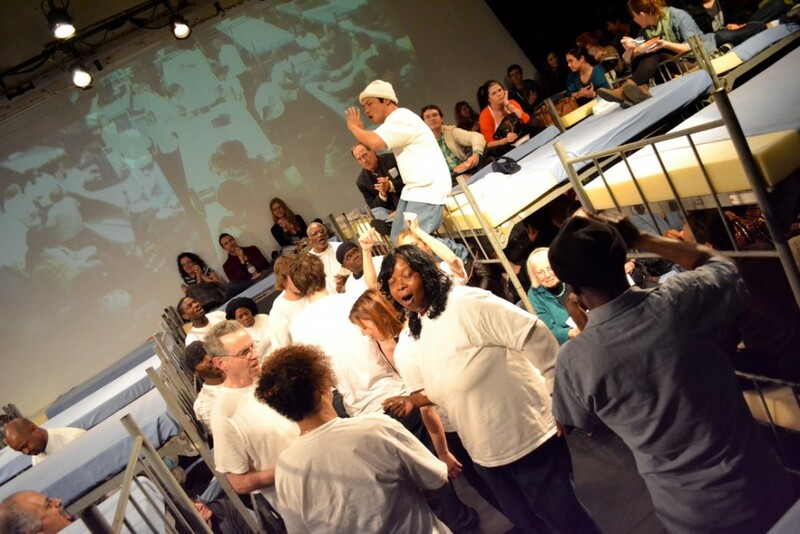 Both LAPD and zAmya use theater to change the narrative of homelessness. We create change by telling the story of the community in a way that supports the initiatives of community residents. We want the narrative of the neighborhood to be in the hands of neighborhood people. We work to generate this narrative and to supplant narratives that perpetuate stereotypes used to keep the neighborhood people down or to justify displacing the community. We want to create recognition of the community and its values. In advance of their Out There performance, I spoke with LAPD founder and artistic director John Malpede and associate artistic director Henriëtte Brouwers about how they’ve used theater to unravel the subject of homelessness, introduce new images and ideas, and change the way a community, a city, and ultimately a nation address this issue. LAPD’s approach to this charge is to immerse itself in Skid Row, serving as an instigator and a connector, focusing on the neighborhood’s assets, creativity, and culture. In conversation with Skid Row residents, the company generates ideas for projects that are fleshed out in weekly rehearsals through improvisations, writing and movement exercises, research and dialogue. Even though LAPD is “the nation’s first theater company comprised of primarily homeless people,” its members don’t really use the word “homelessness” much. Instead they focus on the policies and systemic issues that impact Skid Row. In fact their body of work, if studied as a whole, teaches a lot about the societal conditions that create and perpetuate poverty and homelessness — through aesthetics and form as well as content. The zAmya Theater Project is located in the Twin Cities, where there is no Skid Row. We do, according to the Wilder Foundation, have an estimated 6,711 people experiencing homelessness on any given night. A vast network of agencies and advocacy organizations — including St. Stephen’s Human Services, which “houses” zAmya — work to meet the needs of these people. In this community context, we hold workshops to generate ideas and material, drawing inspiration from specific issues that are politically or socially pertinent to people experiencing homelessness, such as the creation of the Hennepin County Ten-Year Plan to End Homelessness and the foreclosure crisis. When I asked Brouwers how she thinks theater helps make social change, she noted that the qualities required in making a piece of theater are the same qualities needed to approach the problems of our communities: creativity and sensitivity. “Every project asks for its own form, content, process. Not one set of tools,” she notes. A look ay LAPD’s work demonstrates how the form, in addition to the content, is part of the way the narrative changes. In LAPD’s UTOPIA/dystopia, dance eroded gentrification by physically connecting Skid Row residents with people in neighboring communities. State of Incarceration explored the penal system by immersing the audience in a jail environment while guards patrolled the room and ex-cons told stories. Agents & Assets explored drug policy; based on a transcript from a 1998 House Permanent Select Committee on Intelligence hearing on allegations around the CIA’s involvement with crack cocaine in LA neighborhoods, the work featured Skid Row residents deeply impacted by the epidemic in lead roles. Agents & Assets employs a technique Malpede refers to as “recreating imbalance.” He describes the tension that’s created by contrasting the words of the power elite with the life experience of the performers; the tension is unresolved, like the situation itself. 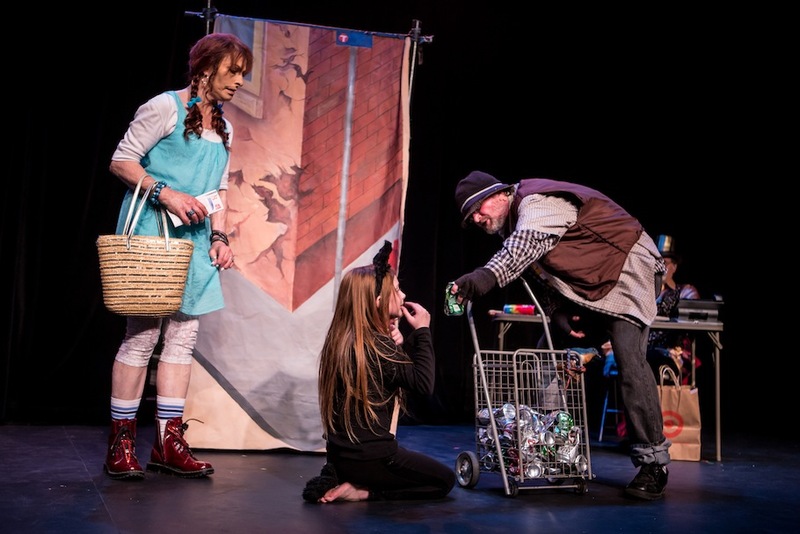 Through the piece, audiences confront that play of power, which leads to a shift in the narrative: now we’re talking and thinking about power — who has it, who doesn’t and how it operates — instead of the disempowerment around homelessness. The most frequent question zAmya gets after a performance from audience members is, “What can I do?” I asked Brouwers how LAPD handles this question. LAPD brings the audience in as a player. Instead of looking at homelessness as a problem someone else has, the performances implicate everyone. Quite directly. Often, audiences are a diverse mix of the public, people in poverty, policy makers, law enforcement, city employees. They succeed piece by piece in generating a community of problem solvers. LAPD’s most recent project, The Biggest Recovery Community Anywhere, made room for Skid Row residents to change the image of the entire neighborhood — with the city of LA as the audience. As with many of LAPD’s works, the idea for the piece arose during research for a previous project. The show demonstrated its power recently when the developer of a mixed-income housing unit bordering Skid Row obtained a liquor license. LA residents showed up to protest, citing both LAPD’s production and the neighborhood’s growing reputation as the “The Biggest Recovery Community Anywhere.” The decision was reversed. While the struggle continues (a beer and wine license is now in question), LAPD will likely continue the conversation with a new piece about it. What’s essential about this struggle is who is articulating its shape. In LAPD’s work, the authority comes from those impacted by poverty, without moral judgment. This is revolutionary when it comes to working with a population that is consistently judged and labeled – “given life sentences,” as LAPD refers to it, as “homeless, crack addict, welfare mom, bum.” In LAPD, everyone has equal voice. The lens shifts from the image of an individual who got themselves into a difficult situation and refocuses on empowered communities making change. Through the work of LAPD we are hearing a different story now about “homelessness.” In the audience, we’re hearing that homelessness is not the real issue; rather a gross imbalance of power and distribution of resources that has historical and political roots is. We’re seeing poverty not as a something to look away from but to look toward for solutions. We focus less on individual choices and more on the choices we’ve made as a society that have led to this crisis. We learn how, in one way or another, we’re all responsible for the way the system operates. With this narrative shift in all of our hands, the conversation and the circumstances can both change. 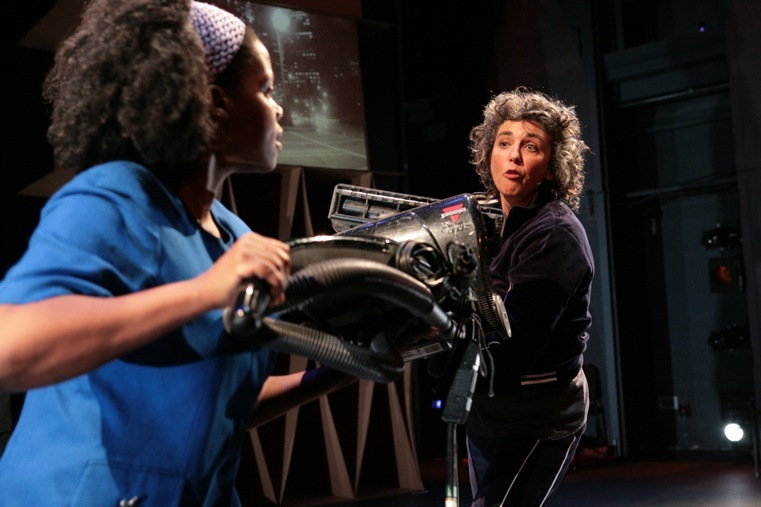 LAPD and Wunderbaum perform the Walker-commissioned new work Hospital during Out There 2014, January 9–11, 2014.